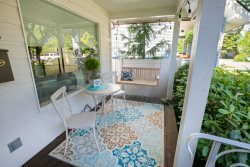 La Riva Condo at Riverstone is located in beautiful Riverstone, only 5 minutes from downtown Coeur d’Alene. This unique area is like its own small town within a city! You’ll be within easy walking distance to a variety of restaurants (including family-friend and fancy sit-down), tons of shopping suited for the whole family and even a movie theater. At the center is a sparkling man-made lake surrounded by a walking trail, large park, playground, and amphitheater. The condo itself is just as appealing and welcoming. You’ll enjoy high-quality upgrades and fantastic views throughout this spacious home. Complete with stainless steel appliances and more than enough room to prepare meals on the stretching granite countertops, the kitchen also seats four at the bar so the chef can have company. Adjacent is a table that seats four and the cozy living room. Overlooking Riverstone, you’ll love curling up in here at the end of the day to enjoy a movie on the plush sectional couch. You'll always get a recharging night's rest in this two bedroom, two bathroom home. The master has a king bed, the second luxurious bedroom has a queen. Attached to the master bedroom, the bathroom features double sinks and a beautiful glass shower and walk-in closet. The also spacious second bathroom has a shower/tub. The washer and dryer located just off the kitchen makes it easy to keep your beach towels and gear clean. This condo has two patio options for morning coffee or evening wine. A door off the living room will take you to the private patio with views of the mountains, and Riverstone community. The shared community patio has a BBQ for grilling evening meals, a large table, and seating.